Oh, goodie for him. It would have been WAY MORE HELPFUL had he voted AGAINST the abomination of the tax bill! 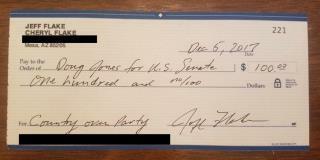 Dope cannot even write a check correctly. "and no/00" is not correct. Proper way is "one hundred------------------------------------------------------" Dollars. The state of Arizona should be named the national zoo. There are more RINOs from Arizona than anywhere!